Annoyed, although the initial buy US Dollars online went OK, I bought $2000 in all and here is where the problem started. I went in store to pick up the money and got 2 x $100 bills, 2 x $50 bills and the rest in 20s & 10s. I asked if they could give me higher denominations but they refused. So I now have a massive wad of bills, great thanks Tesco, won't be using you again. Ordered and paid for click and collect euros online with my mastercard that i only use for online shopping. Transaction complete and money withdrawn from my account. All fine. Went with photo id, card and transaction confirmation - all ticked, then he asks me for me to put my mastercard in their machine - why???? Ive already paid, YOU HAVE MY MONEY! To verify me!!!!! So photo id is not enough, bank card is not enough, confirmation email not enough - they DEMAND your pin!!! Sorry i dont know it as i never use it!!! He then refused to hand over my order. Ive bought and paid, but they refuse to hand over because i dont have my pin for a transaction that MY bank has already sanctioned. Ironic thing is, and ive told them this - they are happy to hand over an order to an unidentified person on a doorstep who might put a fake name on the postys signing for form - totally absurd. Tesco - you are a disgrace. Nowhere else have i ever been asked to put my card in the machine with my pin to collect currency that i have bought online. I wont let this rest. Ordered to Tesco Abingdon to pick up Saturday, travelling Sunday. Arrived to collect and ‘staff off sick, sorry for inconvenience’ Absolutely no provision to deal with this except ‘I’ have to go to another branch 20 mins drive away to collect’. Massive inconvenience!! My time and my expense. Arrived in Oxford and not ready even though this was 40 mins later and have told would be ready and waiting. Apparently phoned home line to notify of problem at Abingdon - 6 people in the household and definitely not called. Not upset at staff sickness upset that only plan B imposes on me. Think out the box Tesco and about the customer - get in staff from another branch, transport that days orders in sealed packages to customer services - just couple of ideas! Excellent service, Euros ordered well in advance of trip, multiple e-mails sent by Tesco with updates, money arrived in store on time as stated. Pleasant staff at store, no problem whatsoever. I assume all the one star reviews were last minute purchases... say no more! *BRILLIANT ALL ROUND SERVICE - HIGHLY RECOMMENDED! VERY GOOD EURO EXCHANGE RATE, QUICK DELIVERY AS PROMISED AND MY €575 CAME IN A WIDE VARIETY OF NOTES RANGING FROM €5 TO €50 SO NO FRETTING ABOUT BEING STUCK WITH JUST HIGH VALUE €50 NOTES!!! WILL DEFO USE AGAIN!!! Very pleased with service. I picked my order up from my local branch during my weekly shop. The young woman in the kiosk was very helpful and cheerful. She dealt with my order efficiently and yet took the time to engage me in conversation. Also pleased with the rate. Very pleased with service received, issues, collected currency from local Tesco store. Only slight moan no confirmation email and no email to say it had arrived but it was there the date I asked to collect it so all good. EXTREMLEY POOR SERVICE. NEEDLESS TO SAY I'M LEFT WITH NO CURRENCY 2 DAYS BEFORE TRAVEL. IF I COULD GIVE NO STARS I WOULD. AVOID. i ordered currency on the 27th december to be collected 4th january.. went 4th january and was told the money was not in but they would order it the next day!!! got it today on the 11th.. could have got it for the same exchange on the internet..!! DO NOT GO TO TESCO FOR FOREIGN CURRENCY.. They can’t keep their promises to deliver on time. It’s a big fat sweet lie to deliver in 2 working days! I have to go on the on through different people long process to get the money from Tesco travel money desk, total spent 5 hours to go through. Not recommended at all. I have just realised Ive got 1.2236 exchange rate yesterday Sunday (non working day) and the rate today and online is generally 1.2556 and above so I have lost around £20 on my £1000 transaction. The bonus was I could pay with my Tesco credit card with no interest until statement date but otherwise if I had checked the rates I wouldn't have used them. Maybe I should have ordered beforehand. They saw me coming. Feel a bit ripped off. I had to give them one star to send my review even though they don't deserve it, I used that service and I was supposed to collect the foreign currency from one of their stores one day before I travel, they couldn't deliver on time so I had to cancel and get the money from somewhere else, and yet I traveled and came back and still waiting for my money to be refunded, it's been more the 11 day's, If I look for only one word to describe that service it would be theft. They don't deliver on time, when you cancel they take cancellation fee and hold your money 10 day's in their account so they get interest charges in their favour. Using your money!! Getting the travel money was poor. Tesco bank contacted me and explained that whilst they had taken the money from my account they'd had a glitch and would sort it out. It would require a different collection code which would be forwarded in within 24 hours but I wouldn't be able to collect it on the day originally stated. Code wasn't forwarded until later than promised! Collected money ok. Tried to return surplus today. After 20 minutes with the clerk trying to a ring a number that didn't answer for her I lost patience and walked away to try another exchange Utterly shambolic with no service whatsoever. Finally one could complain if you are prepared to pay a premium rate phone charge!!! Beware of their buy back rate ! Excellent service .ordered on net which gave me better exchange rate than shopping on high street. Staff was very helpful and friendly. Thumbs up. Whilst the logistics of ordering money online and collecting was very straightforward as I expected, the customer service at the Ilkeston travel money bureau was poor. As a customer that never makes complaints, I have to say the two female staff were unpleasant, with an attitude of really could not be bothered to serve you. One made a sarcastic remark about ordering online, whilst the other worker served. There was not one smile or greeting, and when finished the transaction and money was handed over with no acknowledgement just stared at. Made to feel very uncomfortable and just down right rude. Staff letting down what are being very straightforward procedure. Dreadful experience, big mistake made by customer assistant at Tesco Travel Money, Hibel Rd, Macclesfield. I complained to Tesco Travel Money (Travelex deal with their complaints) who would not take any responsibility or compensate so I ended up seriously out of pocket. 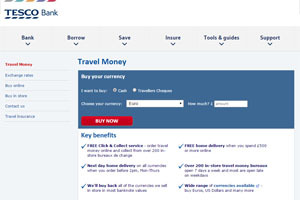 I will not be using Tesco Travel Money or Travelex again ! Great experience. Ordered online and collected from local store the next day. The exchange rate was perhaps not quite as good as other online services but was wary of having to pay by bank transfer, so used Tesco and paid by debit card - easy!!! Tesco, Stockton on Tees. I am a very, frequent and experienced, world traveller, living in Australia, visiting Europe. I asked numerous times about price match before ordering Bulgarian Lev. I was assured price match was promised if anywhere local provided a better rate on the day of collection. Half an hour before I collected my money I found a better rate in Stockton High Street with cash available. As I'd ordered the money from Tesco I did the right thing and went to collect it, presuming the price-match promise stood. How wrong I was. The assistant told me she could not match that particular shop....no explanation given, anywhere else but this one place! I have found nothing in the rules and regulations of Tesco's currency exchange to explain this. The difference was minimal. On the whim of this assistant I was given a lower rate ( had to have the cash as was leaving soon). Very disappointing! Be aware!